This craftsman's companion celebrates the woodturners and innovative artists from around the world who have taken bowl-making to a higher level of aesthetic form. Little Book of Wooden Bowls features 31 of today's finest woodworkers and artisans—Ron Fleming, Liam Flynn, Mark Gardner, Dewey Garrett, Louise Hibbert, Michael Hosaluk, Peter Hromek, Steven Kennard, Ron Layport, Mike Lee, Alain Mailland, Michael Mode, William Moore, Rolly Munro, Christophe Nancey, Graeme Priddle, Vaughn Richmond,Marc Ricourt, Betty Scarpino, Neil Scobie, David Sengel, Hayley Smith, Butch Smuts, Jacques Vesery, Hans Weissflog, Virginia Dodson, Binh Pho, Harvey Fein, Paul Fennell, and Marilyn Campbell—who share their personal motivations, thought processes, and the studio techniques they employ to bring out the breathtaking beauty of wood. Each artist’s profile includes full-color, studio-quality photographs of their most spectacular work, including vessels, bowls, platters, and more, along with insights on their design ideas and objectives. 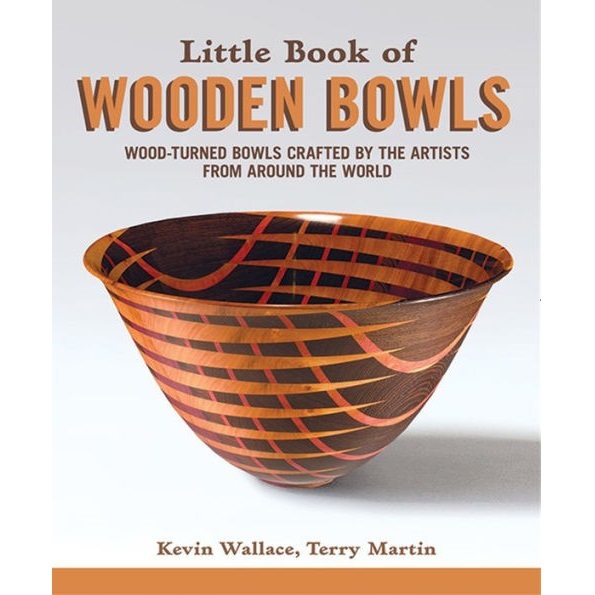 Curated by prominent wood art authorities Kevin Wallace and Terry Martin, this book is sure to become a treasure in every woodworking library.